World Recording-Setting Truck Jump at Indy (VIDEO) - Fantasy Football, Fantasy Football Rankings | Mac Bros.
Indianapolis Motor Speedway was home to the Indy 500 on Sunday, but also to an insane record-setting truck jump. 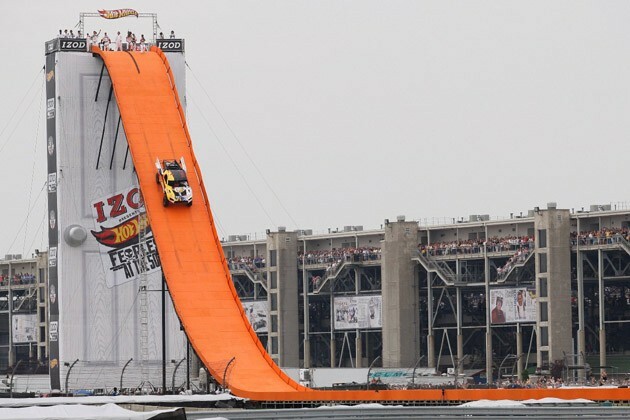 Stunt driver and Top Gear star Tanner Faunst got behind the wheel of a Team Hot Wheels specially modified Pro 2 truck and drove on Hot Wheels inspired track to take flight for 332 feet, besting the previous record of 301 feet. We've attempted this jump many times in our living room as kids. This, however, was slightly more spectacular.